Is this the summer that the backyard swinging is over? In the last year, your kids could have outgrown that swing set rendering this play area useless. You can keep the swing set up as a reminder of the kids growing up. A better option would be to hire Junk King to take care of your swing set removal. That way you can put that backyard space to better use. If you want Junk King to take care of your swing set removal, let them know when you schedule the appointment. Since the Junk King crew will be taking apart the swing set, they’ll need a few extra minutes to get the job done. They’ll have all the tools necessary so don’t worry about busting out your toolbox. Once the swing set has been taken apart, they’ll load up the pieces on the back of the truck. Technically, you could end the job right there but why not take full advantage of the Junk King crew? Put them to work removing all those other eyesore items that are taking up space in your yard. This is a good time to get rid of your old lawnmower, hammock, grill or patio furniture. If any of those things are rusted or broken, then there is no need to hang onto them. Give it all to Junk King. As long as Junk King is clearing up your backyard, you can also set them to the task of clearing out the clutter from the inside of your home. Remember, the Junk King crew does all the lifting. That means they can pull out pieces from the garage or basement. You’re only limited by what you want to get rid of. After everything is loaded onto the truck, you can get back to your busy day. Of course, if that means relaxing in your clean home, then go for it. The Junk King crew will spend the rest of their day insuring that your junk is disposed of in a responsible manner. Add it all up and you’ll see that getting rid of your junk is as easy as making a phone call. Actually, you can even schedule your Junk King appointment online. That is truly the simple way of getting this job done. Don’t put off your swing set removal or junk hauling any longer. Let Junk King take care of that job. 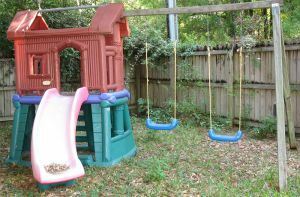 This entry was posted in Pasadena TX Swing Set Removal and tagged Junk King, Pasadena TX Swing Set Removal on June 17, 2014 by Jose Urdaneta. Last updated August 1, 2017 .